Eric was a great, famous man. He was a general in the US army, a pilot for many years. He invented many things. During the Second World War, he was in a military plane with a special message from the president. He and seven crew members suffered a plane crash on the rough Pacific Ocean. Miraculously, all of the men survived, crawled out of the plane, and climbed into life rafts. Captain Rickenbacker and his crew floated for days on the rough waters of the Pacific. They fought the sun. They fought sharks. Most of all, they fought hunger. By the eighth day their rations ran out. No food. No water. They were hundreds of miles from land and no one knew where they were. They needed a miracle. That afternoon they had a simple devotional service and prayed for a miracle. Then they tried to nap. Eddie leaned back and pulled his military cap over his nose. Time dragged. All he could hear was the slap of the waves against the raft. It was a seagull! Old Ed would later describe how he sat perfectly still, planning his next move. With a flash of his hand and a squawk from the gull, he managed to grab it and wring its neck. He tore the feathers off, and he and his starving crew made a meal – a very slight meal for eight men – of it. Then they used the intestines for bait. With it, they caught fish, which gave them food and more bait…and the cycle continued. With that simple survival technique, they were able to endure the rigors of the sea until they were found and rescued. Eddie Rickenbacker lived many years beyond that ordeal, but he never forgot the miracle of that first lifesaving seagull. And he never stopped saying, “Thank You, Lord.” That’s why almost every Friday night, for as long as he lived, his neighbors in Florida will see him, an old man above ninety, slowly going with a bucket, full of fish and shrimps, feeding the seagulls. 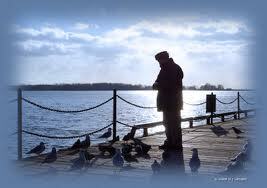 He always had a heart full of gratitude towards these birds, for one of them send by God, saved his life. If Eddie can come back to feed the seagulls, as an act of gratitude for saving his life, how much more we should remember the good things God has done for us…Remember the miracles of the past…salvation, healing, deliverance, provision…this grateful remembrance is one of the greatest weapons in spiritual warfare! ← I blow my trumpet! Blow yours too!